Controlled Labs Orange Triad Review – Worth the investment? Aggressive, rough, borderline dangerous are three things that come to mind when thinking about Controlled Labs – the manufacturer that brought us products like White Rapids and Purple Wraath. Controlled Labs might probably be the last company we’d think of that would manufacture multivitamins, but they already did – with Orange Triad. Controlled Labs Orange Triad is a multivitamin specifically marketed towards the health and fitness community. According to Controlled Labs, Orange Triad specifically caters to the typical vitamin and mineral deficiencies of an individual who works out. Controlled Labs Orange Triad is designed neither to improve performance or enhance results, but to preserve the health of the user. In this review, we’ll take a closer look at Orange Triad to see if there’s any merit to their claims. Not all multivitamins are created equal. There are several multivitamins that cater to a specific goal, like health maintenance and sickness prevention, and there are other multivitamins that target stress and other physiological problems. Controlled Labs Orange Triad is neither of the two. Orange Triad is designed to be a joint and muscle supplement to help users endure the physical damage that high intensity training might cause. Who uses Controlled Labs Orange Triad? 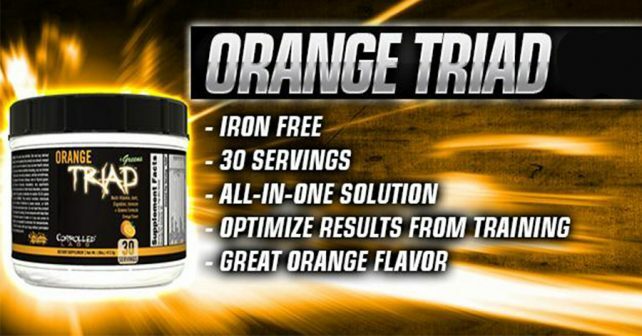 Controlled Labs Orange Triad is popular among recreational athletes and bodybuilders, especially those who are keen on purchasing supplements for performance enhancement. Orange Triad is also used by people who have bought bundles to get discounts on Controlled Labs products. Measuring the effectiveness of a multivitamin is a tricky task. Multivitamins aren’t created to be the same, and each formula would yield different results. You simply can’t compare one to another. We decided to measure Orange Triad based on its ingredients and what you should expect when using them. These ingredients are important to anyone who aims to maintain a healthy body while working out. Orange Triad contains three different proprietary blends that supposedly help joint movement and digestion. These functions are solutions to the common problems that recreational bodybuilders and athletes have, and if Orange Triad proves to be consistent in providing results, then we’d highly recommend it to our readers. However, without the exact blend information, we can’t say if the ingredients included in the blend is sufficient to provide these results. Orange Triad costs $9.99 per 60 tablets, but its serving size is 6 tablets. Essentially, you’re shelling out a dollar a day for a multivitamin, which may be too much for some. Orange Triad is a good-enough supplement, especially if you’re trying to have all your bases covered, but at $1 a day, it’s simply too expensive. There are other multivitamins out there that are better investments like Ultimate Man Once-A-Day.